Job circular of Exim bank has been published on daily newspaper and the websites of EXIM Bank Ltd. Minimum post-graduation from business studies is the minimum requirements of applying this post. Human resources division of Exim bank ltd has announced the vacancies and eligible candidates are requested to apply for this post within due date. You can also see IFIC Bank Job Circular. Education Qualification See Job Advertisement. Experience Requirements See Job Advertisement. The work environment of Exim bank is employ friendly, Exim bank offers attractive salary packages for their employees along with provident fund, yearly festival bonus, yearly profit sharing, service benefits, home loan, car loan, insurance service etc. Besides Exim bank engage in various corporate social responsibilities such as health care service, scholarship program for meritorious poor students, education promotion scheme, help in natural calamities, 5 core donation to prime ministers welfare fund in 2017, donation to school college computer lab set up, city beautification etc. In a word Exim bank budgets minimum 2% profit for the programs of corporate social responsibilities. EXIM bank proved that they are more than a bank. 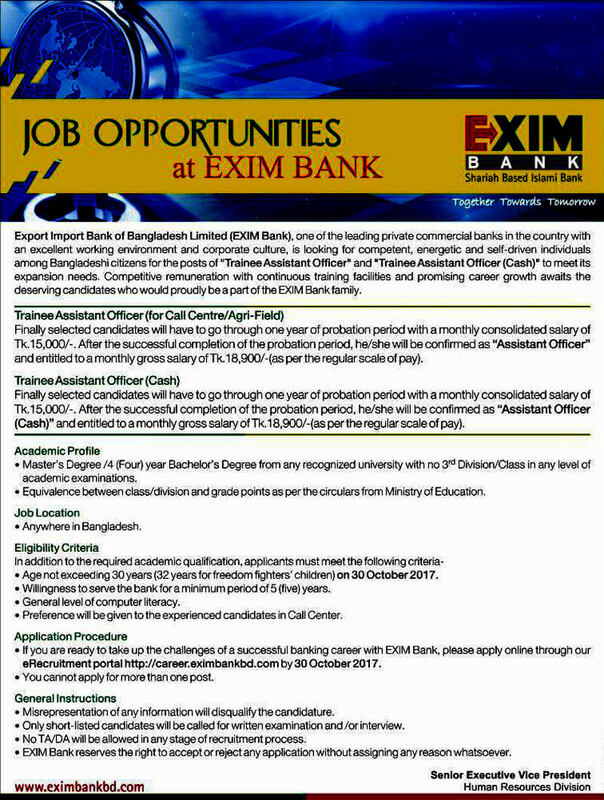 If you want to be the part of Exim bank apply for it and took the chance.